All of our products have been updated with new features! 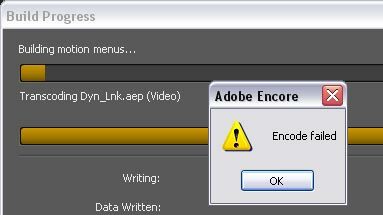 While doing trial runs with our updated Adobe Encore workflow, we encountered some disturbing bugs with Encore (no surprise). 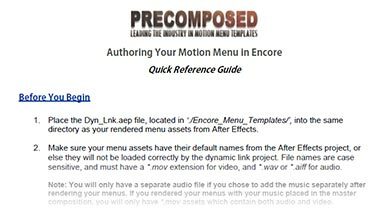 All of our products have been updated with our latest CS4 workflow which eliminates any pause after the Intro Sequence, however before we release it, we wanted to add some additional updates to our Pro Motion Menu Kits. We seem to get a lot of customers asking how to remove the pause between the intro sequence and main menu during playback on set-top players. Most players will freeze at the end of the intro for half a second or so, as the player seeks the disc for the main menu. Some players unfortunately even display black as it searches for the main menu, losing some of the “seamlessness” of the menu, and taking away some of it’s impressiveness. Pro Motion Menu Kit: 07 – White Wedding is now available for purchase!